When Vasundhara was CM, Lalit Modi was king. Power equation changed, his throne is now rocking. Facilitated entry of big builders in the state. Every big land deal had to have his clearance. Influenced change in the liquor policy which led to the proliferation of liquor outlets. Became an election issue. Has an extravagant lifestyle, owns a private jet. Would stay for days in the luxury suite of the Rambagh Palace Hotel. Rode roughshod over anyone who crossed his path, whether it was a constable or an IPS officer. A slapping incident sparked a near-revolt in the Jaipur police. Was named in an FIR for misappropriation of RCA funds. The money has subsequently been deposited with the RCA. The opulent Prince’s Suite at the Rambagh Palace Hotel in Jaipur was once occupied by Maharani Gayatri Devi’s son, Prince Jagat Singh. In the 21st century, though, it has been home to a controversial modern-day prince, Lalit Kumar Modi, for several days every other month for the last four years. The jetsetting industrialist, man about town and architect of the spectacularly successful Indian Premier League, whose reported fondness for the good life is matched only by his overweening ambition, didn’t just administer the Rajasthan Cricket Association (RCA) from this charmed, Rs 90,000-a-night zone of luxury. 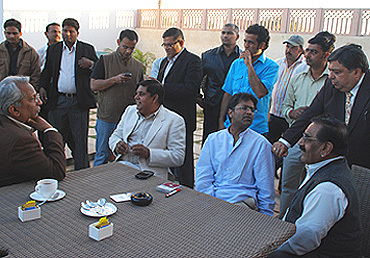 He reportedly ran Rajasthan, courtesy his proximity to the former state chief minister, Vasundhararaje. Such was his influence that it earned Modi, 46, the sobriquet of Super Chief Minister, his role becoming a key issue in the state assembly elections last November. Chief minister Ashok Gehlot, then leading the Congress election campaign, openly accused Modi of acting as an "extra-constitutional authority". With Vasundhararaje voted out of power and Gehlot ensconced in her seat, the man who ruled Rajasthan from behind the throne, riding roughshod over civil servants and ministers, is finally facing the heat. Last month, Modi had to cool his heels for several hours at a police station here after an FIR was registered on the basis of a complaint by a Samajwadi Party activist for forgery. And to think this was the man who had once slapped a constable for walking into his box at the Sawai Mansingh Stadium (SMS) during a cricket match, triggering off a near-revolt in the city’s constabulary. But even as Modi finds the going tough with his friend and patron Vasundhara in the opposition, tales of his imperious style and skills in bending the law have become the stuff of contemporary folklore here. It wasn’t just the RCA which reeled under his onslaught—what with his election as president mired in court cases, allegations of financial malfeasance and forgery—but also bureaucrats, police, landowners and anyone else who dared cross his path. Modi’s friendship with Vasundhara, 56, dates back to at least 1990. A member of the then Chandra Shekhar government at the Centre recalls having seen her accompany Modi to a minister for seeking clearance to establish a factory near Gwalior. The application was in the name of his father, K.K. Modi, son of Rai Bahadur Gujarmal Modi. Grandfather Modi had migrated from Patiala to establish what’s now known as Modinagar in UP. "Gujarmal created employment, contributed to the wealth of the nation. What has his grandson done?" asks an industrialist politician. Well, the grandson ruled Rajasthan. He was able to do so because all powers during the BJP’s five years of rule were apparently centralised in the chief minister’s office—everything from transfers to change in land use to liquor licences and mining leases. Decisions on these issues had Modi’s imprint. "It was a case of single window clearance," a fellow industrialist, cricket aficionado and politician told Outlook. "Modi simply summoned civil servants with their files to his suite at the Rambagh Palace and told them what to do. And if anyone demurred, he’d simply say, ‘I’ll have to talk to Vaasu (the name by which Vasundhara’s close friends address her) then’." Walk into the state secretariat and this story will be whispered repeatedly, along with tales of high-handedness that has left many a bureaucrat bruised. Soon, it becomes hard to separate fact from fiction. As a senior police officer put it, "In the end, Vasundhara faced such a crisis of credibility that anything people said about her and Modi was believed." The two most popular stories are about the public fight he had with IAS officer Mahendra Surana, and another with IPS officer R.P. Srivastava. Surana, who was secretary, employees’ welfare, recalled that in 2007 he had accompanied friend Dr Hemendra Surana, a doctor in the army and a former Ranji player, to watch a match at SMS. Dr Surana had asked Modi for passes earlier but when his request was turned down, he procured them from minister Rajendra Singh Rathore. As the two waited to gain entry, Modi came in and saw the Suranas show their passes to the girl at the door. "He simply came up, asked the girl what was happening, grabbed our passes and tore them up. The reason for his anger: he thought Dr Surana was with the Rungta group (of Kishore Rungta, rival to Modi in the RCA)." The Srivastava incident was similar. Modi was indeed a law unto himself. Like in the case of the Amer havelis. He is alleged to have manipulated government rules and pressured local officials to secure control of at least two of the havelis, with a view to renovating and converting these into a heritage resort. Mahant Shiv Prakash Bhattacharya, the 75-year-old titleholder of the crumbling, seven-storey Choor Singh ki Haveli which stands in the shadow of the historic Amer Fort, is holding out. He has gone to court to thwart Modi’s attempt to take over his haveli. "My ancestors were priests in Jessore (in Bangladesh). The Maharaja of Jaipur brought them here and set them up as royal priests more than 400 years ago," says the remarkably fit Bhattacharya, in his perfect Banarasi Hindi, with just the slightest touch of a harsher Rajasthani burr. "The irony is that today one Lalit Modi has hatched a conspiracy with another member of the Gwalior royalty, Vasundhara, to try and evict us." The haveli issue is now so hot in Jaipur that former vice-president Bhairon Singh Shekhawat visited the area a few days ago to express his solidarity for those displaced by Modi. The IPL czar doesn’t deny he owns these havelis, saying "it’s a small, insignificant property, which doesn’t make any difference in my life". Perhaps not, but for those who lived there, it was the only roof over their heads. These havelis are clearly small change compared with the thousands of crores that have changed hands as Jaipur expanded to swallow agricultural land and other outlying towns. Under the cover of the controversial Section 90 B of the Land Acquisition Act, acres of agricultural land has passed into the hands of big builders from Delhi. "Section 90 B," explains an IAS officer, "was intended to be a one-time welfare measure with a cut-off date to give relief to local farmers." They were allowed to convert their land into non-agricultural land. "The area was defined, the mechanism defined," adds the IAS officer. "But it was not meant to be an enabling clause for crass commercialisation which is what it became during the BJP era, when the provision about the cut-off date was given the go-by." The Jaipur Development Authority framed ad hoc rules to get around the original objective of Section 90 B. Presiding over this change in land use, many allege, was Lalit Modi. The land issue is now the subject of a probe by the government. BJP leaders, in fact, are so embarrassed about Modi’s role that they now all want to distance themselves from him. "Modi had nothing to do with the BJP," says state party chief Om Mathur. "If he had anything to do with the government at that time, let there be an inquiry and the truth come out. He may have been involved, may have made mistakes—it’s up to the current government to find out." So, will we witness the fall of Lalit Modi? Perhaps not, despite all the colourful stories about him. For one, he has powerful friends in the UPA establishment—from NCP supremo Sharad Pawar to SP leader Amar Singh to superstar Shahrukh Khan, who is friendly with the junior Gandhis, not to mention Rajya Sabha MP Rajiv Shukla and several Congress MLAs in Rajasthan. Indeed, at a dinner in Jaipur last week to celebrate the return of Congress to power in Rajasthan, the subject of Lalit Modi was a conversation-buster in a gathering comprising cabinet ministers and state MPs. Caught between admiration and fear, a very senior state leader said, "There is a very thin line between love and hate." But the consensus was that there was little point in pursuing the corruption issue even though it had been an important one in the assembly elections. As one minister said, "Corruption is not really an election issue." The last word came from a young Congress leader: "There’s a Modi in every state." And all Modis, we have learnt, are known to prosper. "Shekhawatji Wanted Me To Send Vasundhararaje To Jail"
"There Will Always Be Detractors If You Create Something"